Many parts of California are having a year for the record books, with snowfalls dwarfing street signs and blanketing the ground in ways not seen for years. Here at Expedition Motorhomes, sunny Southern California is our preferred home but that’s not to say we don’t love and appreciate the winter beauty in the mountains. As springtime is quickly approaching, now is the time to take advantage of these winter wonderlands. If you are looking for a specific excuse to visit one of California’s unique ski communities in your Los Angeles motorhome rental, check out these events that really put these places over the top! This year on February 26th, head to Sierra-at-Tahoe Resort for an annual celebration of all things winter. Winterfest sponsored by Subaru is one of the premiere events held at this family-friendly resort each winter and, if you’re on a road trip to Northern California in February, it is not to be missed. Winterfest is complete with gear giveaways, live music, s’mores and hot chocolate, and plenty of fun and games for the whole family. Add in the picturesque backdrop of Lake Tahoe, and Sierra-at-Tahoe becomes a very noteworthy road trip destination. At just under 5 hours north, Mammoth Mountain is the closest major ski resort to downtown Los Angeles. This behemoth of a mountain is far more than simple proximity. People from around the world visit Mammoth for its great culture and epic terrain but, from March 15 – 19, a different kind of party comes to town. Elevation Mammoth is this mountain’s gay ski week, and it offers some of the most fun events, parties, and celebrations of any ski resort in the country. When paired with its world class skiing, Elevation Mammoth is the perfect wintery getaway for your Los Angeles motorhome rental. From March 31st to April 2nd, the parking lot nestled underneath Squaw Valley Resort’s famed “Tram Face” turns into the biggest party on Lake Tahoe’s north shore. This year marks the third annual Winter Wondergrass celebration – a beer and bluegrass festival complete with craft beer and national touring acts from across the bluegrass, folk, and traditional music genres. This celebration is the perfect way to say sayonara to winter in Tahoe with good beer, great friends, and inspired music from some of the country’s best touring acts. Cheers! While the season is quickly coming to a close, it’s not yet too late to celebrate winter! 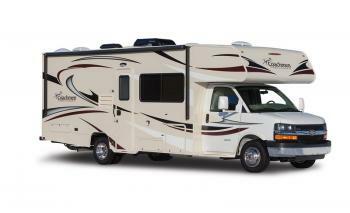 Visit us at Expedition Motorhomes today to reserve your Los Angeles motorhome rental. Then, it is up to you to hit the road for an unforgettable winter getaway – whether that be to one of the above festivities or an adventure all your own.